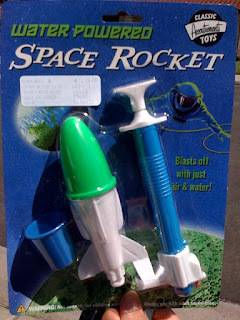 A favorite toy of mine growing up was a water & air-powered rocket. Well, when Celeste and I were at Fry's over the weekend I came across a pretty close reproduction of the rocket that I launched dozens and dozens of times on hot summer days while living in Danville, IL (not a city worth visiting, trust me on this). 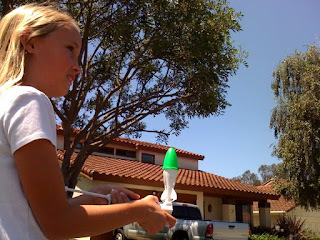 The main difference is that my rocket had a translucent red nose cone and a red and white pump. Why do I remember this sort of minutiae? five bucks, how could I say no? We filled 'er up about half way with water (instructions state between 1/3 to 1/2 full) and pumped it 15 times to generate the needed air pressure. LIFTOFF! With soaked shirts and firmly-planted smiles we watched it sail 10-12 feet up in the air. Not only sideways (as pictured), but on a few occasions actually up. Of course I remember my old rocket sailing hundreds and hundreds of feet, scraping the clouds hovering above Central Illinois. But everything seems bigger when you're a kid.